is the Ernest Hahn Chair and Professor of Real Estate Finance at the University of San Diego. leads Dinn Focused Marketing, Inc.
Research conducted by Norman Miller, Ph.D., University of San Diego; Jeffrey D. Fisher, Ph.D., Professor Emeritus of Indiana University; Paige Mueller, CRE, at Eigen 10 Advisors, LLC; and Michael Dinn, CRE, at Dinn Focused Marketing. Continued from Volume 42, Number 6: “Housing Demand is About to Change – Here’s Why”. A recent study commissioned by the National Multifamily Housing Council (NMHC) and the National Apartment Association (NAA) through Hoyt Advisory Services forecasts multifamily housing demand through 2030 for the U.S., all states individually, and 56 selected metropolitan and geographic areas.1 As part of this study, immigration was considered as one source of future demand for U.S. housing. What was not expected in this study was how critical immigration is, and how it increasingly will be a source of future population growth. Immigration is currently providing approximately 45% of the U.S. population increase, and in a few years could provide more than 50% of the net new housing demand. Because of aging, U.S. population growth, including immigration, has already slowed from 1% in 2001 to 0.7% by 2016, and could slow by half this pace through 2030 without positive immigration growth. Immigration to the U.S. is important as a source of labor, including both high-skilled labor, where the U.S. has shortages, and low-skilled labor, where many Americans prefer not to work. These shortages are particularly important given the low rates of unemployment in 2018. Additionally, migration between cities is a strong indicator of the economic health and prospects of each metro area. Interestingly, some slow-growth cities with poor in-migration patterns from other U.S. cities will be completely dependent on international in-migration to create population growth going forward or will risk experiencing a shrinking and aging population base. These cities are not necessarily where you think they might be – many are non-border cities, particularly in the Northeast. And while some would argue that the world certainly doesn’t need more people, an aging population base that has reached retirement cannot be supported by the transfers inherent in the current entitlement system based on a shrinking younger counterpart. Population size and growth are the underlying base factors of real estate demand estimates. While demographic and age trends are somewhat predictable, the current debate surrounding immigration policies now puts a large band of uncertainty (or error margin) around future real estate demand. We set out to understand what parts of the country are at more risk due to this uncertainty. 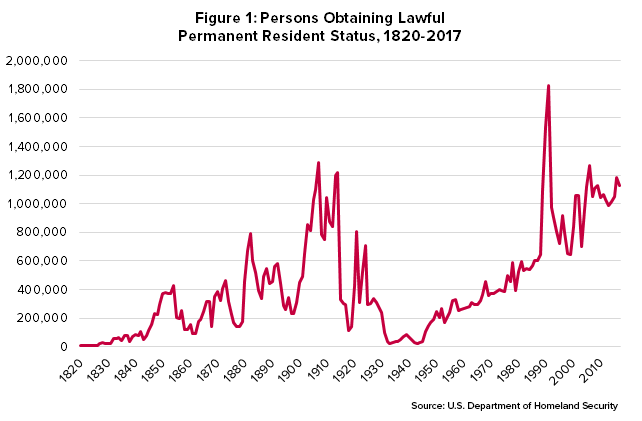 The Department of Homeland Security estimates that 845,951 people received lawful permanent resident status in the first three quarters of 2017, down by 5% from the year before as shown in Figure 1. Nearly half (46%) of those residents came from seven countries: Mexico, China, India, Cuba, Dominican Republic, Philippines and Vietnam. Similarly, the number of non-immigrant admissions by academic students was down by about 5% to 879,947 in the first half of 2017. However, economists and other organizations have raised concern about immigration policy going forward. Prior to the 2016 election, Moody’s Economy.com team issued a report entitled “The Macroeconomic Consequences of Mr. Trump’s Economic Policies”2 stating that Trump’s policies would be a “significant retreat from the increasing globalization of the U.S. economy.” Since the election, we have observed a steep decline in the number of foreign applicants to U.S. universities, increased challenges for tech companies staffing engineers and programmers, and a general decline in the number of foreign applicants for U.S. visas.3, 4, 5 Figure 1 tracks lawful immigration over time. A formal analysis of two distinct immigration policies was recently completed by REMI9 and commissioned by the Business Roundtable.10 In one case, REMI analyzed the economic implications of “strict enforcement” of current U.S. immigration laws. This policy would include deportation and voluntary departures along with an aggressive border security program. In the other scenario, they considered “balanced reform”. The balanced reform policy includes improved border security, but also allows H-1B reforms to permit temporary high-skilled workers, H-2A reforms to allow temporary agricultural workers, and some temporary H-2C lower-skilled workers, green card reforms that eliminate the lottery but consider needed skills, and a pathway to legal status for those brought here as children and/or working here for many years without criminal records. The H-2A workers are critical to the agricultural industry, especially in California, and the H-2C workers are especially important in construction, waste management, food service, repair services, personal and laundry services and serving private households. The H-1B program is especially important to universities and high-tech firms that cannot find sufficient engineers and computer programmers. The U.S. housing market is being buffeted by opposing forces. Home ownership rates rise with age. 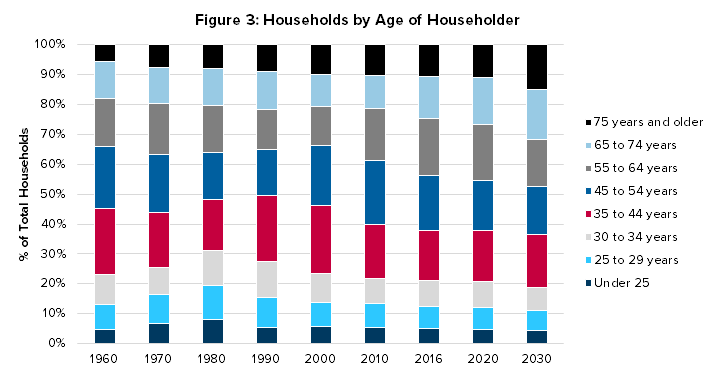 In Figure 3, we observe the degree to which older population should create upward pressure on homeownership rates. When demographic trends are considered, we observe that for the next dozen years or so, more than half of the U.S. population growth will come from Hispanic growth13 (see Figure 4). 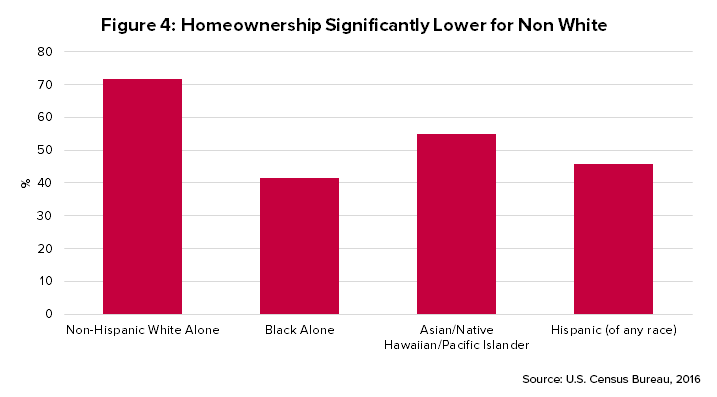 This group has had increasing home ownership for several years, but at 45%, we will continue to see overall U.S. homeownership rates decline even with a homeownership rate increase for the Hispanic households. Additionally, international immigrants are much more likely to be renters (as shown for selected states in Figure 5) for a variety of reasons, including: uncertainty over expected tenure in any given location, uncertainty over residency status, less financial literacy, and lower incomes and less wealth for down payments, as historically these group exported much of their excess cash to relatives from their country of origin. When the impact of an aging population is combined with immigration trends, student loans, stricter mortgage underwriting, higher interest rates, and delayed marriages, we expect to observe a generally lower homeownership rate over the next several years, possibly dipping below 60% if interest rate increases materialize. 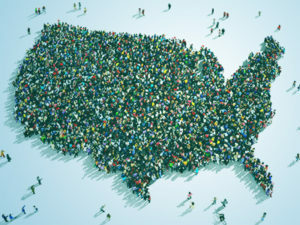 With respect to regional immigration and U.S. natural population increases, it is worth noting that the impact of immigration is much greater in markets where the natural population growth rate has slowed or stopped entirely. In Figure 6, we show a map where the darker green areas are those most affected by a lack of natural population increase and net migration from other states, and thus become highly dependent on international in-migration for any positive population growth. States most affected are not the border states which often have younger population bases and positive in-migration from other states. Interestingly, those most dependent on international in-migration for growth include states such as Maine, Michigan, West Virginia and generally the Northeast U.S.14 We have the highest uncertainty in real estate demand in these areas as it has the most exposure to national immigration policies. Demographic trends and rental demand were covered in more detail in a prior article by the same research team,15 but here we simply note that the demographic trends will increasingly force greater demand for larger rental units. Figure 7 measures household size differences by ethnic groups. Keep in mind that the fastest growth is among the Hispanic group. Looking at metropolitan areas, we find that the Hispanic renters are already very significant in the following markets where they make up more than 20% of all renters. Immigrants are particularly important to the economy of the U.S. where they fulfill a high percentage of the lower-skilled temporary jobs in agriculture, along with many jobs in hotels, waste management, repair services, personal services such as landscaping, childcare and house cleaning, as well as some construction jobs, such as roofing, that remain less attractive to established U.S. residents. Immigrants are also important in skilled jobs such as engineering and programming jobs, where the U.S. is not able to supply sufficient high-skilled labor. Without these immigrants and the undocumented immigrants raised here, known as the DREAMers, our U.S. economy will suffer. Some analysts predict an earlier U.S. fiscal budget solvency crisis among U.S. entitlements if a younger labor pool does not pay into the system. In a parallel pattern, immigrants are a significant portion of the population increase, nearly equaling that of the natural increase, and expected to surpass it by 2023, although recent immigration policies have greatly threatened these trends. 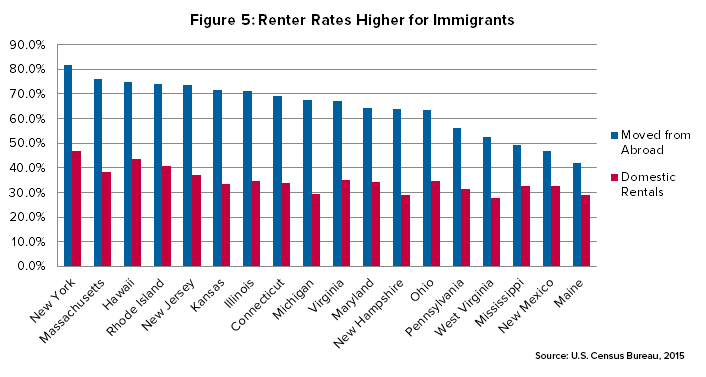 Immigrants are primarily renters and do add significantly to the renter demand pool. In some of the Northeast areas of the U.S., they represent 100% of the net population increase. Yet, immigrants are not evenly distributed and tend to grow faster in areas where they are already at critical mass, that is, where jobs, amenities and services can be provided that cater to various immigrant groups.